A co-worker and I were out on Cascade Road when she said she was hungry. Huh. What a coincidence…so was I. We didn’t want to go to far and the only thing I really knew of was sandwich places. She chose Jimmy Johns which is one of my least favorite food choices, but I figured I’d drop her off and walk to a Quiznos in the same parking lot. As I was walking towards that Quiznos, I noticed another place I’ve been wanting to try for a long time, but always seem to forget about. Zoup! is a regional chain with three Grand Rapids area locations. Overall, there are fifteen locations in the state of Michigan. The Zoup! I happened upon is the store on Cascasde Road just off the I-96 interchange. There’s a small shopping center on the west side of the road and Zoup! takes up a corner storefront. 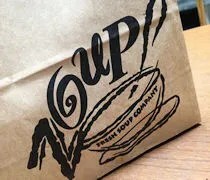 The restaurant specializes in soups, sandwiches, and salads. The order set up is sort of like a fast food joint. There is an area near the cash register which shows off their soup selection which changes daily and varies by store. The sandwiches are made on a counter behind the soups and the salads appeared to be pre-packaged. I’m not a s0up person and it seems too hot for soup anyway. I found a coupe sandwiches on the menu board that sounded good to me, but I decided to go with the half Southwest Turkey and a half Chicken Caesar Salad. Wait. Did you read that right? Did I misspell burger S-A-L-A-D? Nope. Not a typo. I ordered a salad. The half-half combo set me back a little over seven bucks and I declined the drink because they have Coke fountains and there is a gas station nearby that I could get a Pepsi from. It took less than ten minutes for my sandwich to be made, toasted and wrapped up before being put into a nice paper bag with the salad. As I was getting back to the car, my co-worker who went to Jimmy John’s was walking up as well. We needed to get back to the office to finish our assignment for the day. I actually went for the salad first once I got back to the break room. 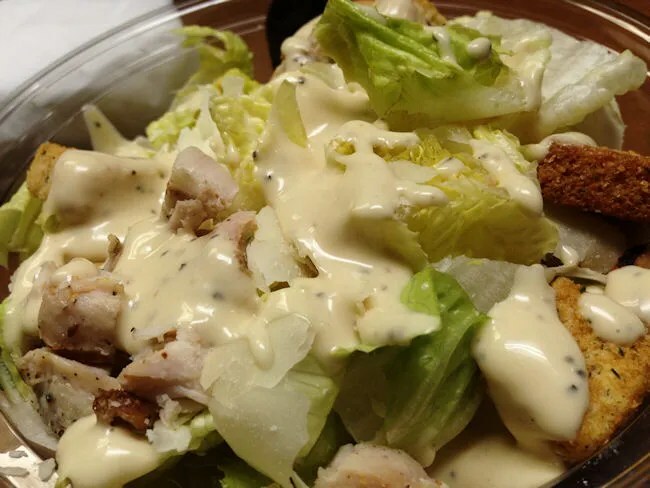 The iceberg lettuce is packed into a plastic container with a cup of Caesar dressing, chicken, Parmesan cheese, and croutons. Being a carnivore, I would have liked a little more chicken, but the salad was good. There was plenty of dressing which is always my concern when ordering a salad at a restaurant and the croutons were nice and crunchy, but not stale. When I unwrapped the sandwich, I was pretty underwhelmed. The Southwest Turkey Sandwich is sliced turkey, pepper jack cheese, tomato and Chipotle mayo on Ciabatta bread. At first glance, the sandwich looked like all bread, but the ingredients actually packed quite a punch. In another surprising move, I left the mayo on and it was delicious. There was a little bit of heat to and it was spread on lightly, so it was just enough to add a lot of flavor, but not so much I was grossed out like I usually am with mayo. The bread, however, stole the show. 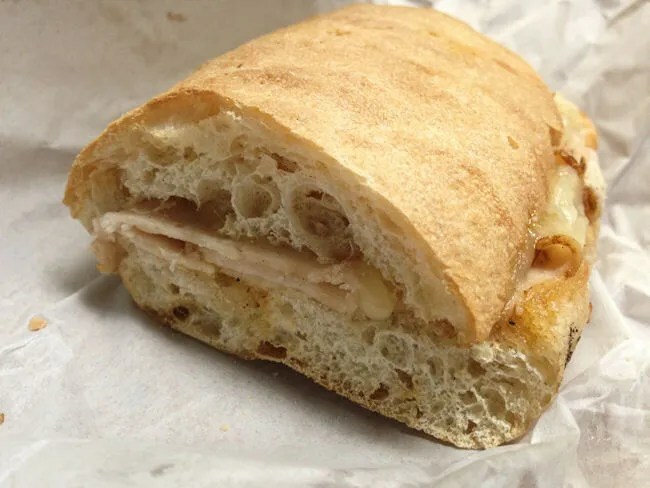 I actually don’t mind there was more bread than turkey because the use of Ciabatta bread makes my tummy happy. Zoup! is a great alternative to some of the other franchises out there. In winter time, there soup selection will warm you up on a cold day and the rest of the year, the sandwiches and salads are a surprising alternative. I haven’t been avoiding Zoup! the last few years, but I never made it a point to go there either. Now I know.